The powerful storm may also have an impact on the political landscape. County election officials asked Florida Gov. Rick Scott to help workers cope with damage to polling places that will be used in next month's midterm elections. "I firmly believe the governor needs to issue an order that allows for a wide range of things," Okaloosa County Supervisor of Elections Paul Lux wrote in an email to the state's Division of Elections on Sunday. "[Counties] will need the ability to open fewer sites for all voters who remain, due to a lack of polling places and staff." The Federal Emergency Management Agency said it's provided 715,000 meals and 1.5 million liters of water per day in Florida -- and transferred more than 350,000 meals to Georgia. 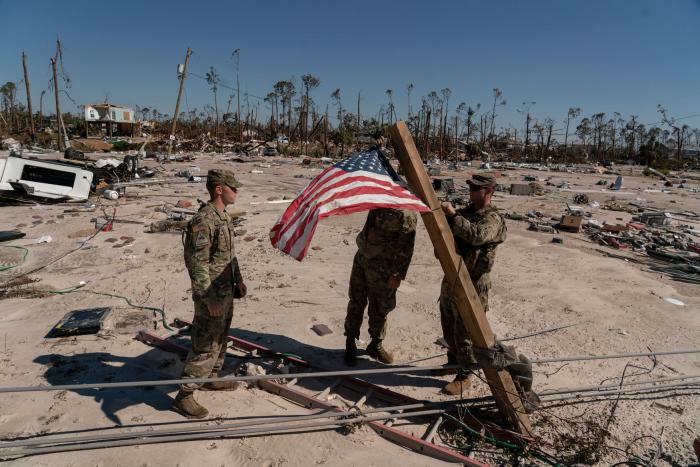 "More than 16,000 federal employees, including over 8,000 military personnel have been deployed to support Hurricane Michael response efforts," FEMA said. "Since Michael's landfall, search and rescue teams from FEMA, the U.S. Coast Guard, National Guard and others, working alongside state responders and volunteers, have completed 110 evacuations, 4,193 rescues/assists, 15,287 shelter in place checks, and 128 animal assists."